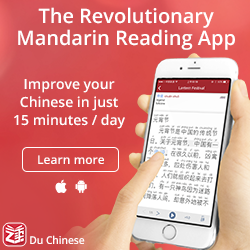 Wouldn’t it be great if there was a place where you could find Chinese learning resources, blogs, tools and apps, all suitable to your level and preferences? I think that sounds great, so I today I’m proud to announce the launch of a new section of the site, simply called Hacking Chinese Resources. You are a beginner who wants to learn vocabulary and want to find tools and apps that can help you achieve this. There are currently 15 resources matching your request. You are an intermediate learner who wants to find listening material suitable for you level. You can check either resource collections or resource highlights. The first tag is for sites that collect lots of material and the second is for individual files, clips, videos and so on. You are an advanced learner who wants to improve your speaking ability (pronunciation, perhaps), but you’re not sure how to go about it. The information and advice category is for you! 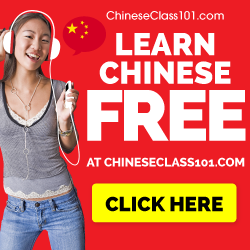 You want to find Pinyin-related resources. 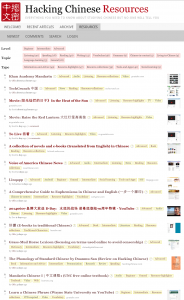 You simply search for “Pinyin“ and find 16 resources that matches your query. If you want to get updates on Twitter, I have set up a new account that posts new update regularly: @ChineseLinks. Think this sounds cool? Want to participate? Hacking Chinese Resources is run on an invite-only basis at the moment, so even if everybody can use the site like I have described above, you need to be invited if you want to post resources, discuss or vote. The reason is that I want to expand this section gradually and deal with potential problems as they appear. If you want to join the fun, please leave a comment to this post and tell me why you want to be invited (don’t forget to fill in your e-mail address). The motivation to create this section of Hacking Chinese sprung from a genuine need. Even though there are many sites where you can share learning resources, they are all mostly focused on the short term, usually in the form of discussion forums, social news sites or feed aggregators. I will continue using these sites myself and my aim is not to supplant them. Indeed, you can find all of them listed as resources already. Even though Hacking Chinese Resources have similar functions, that’s not the main point. Instead, a carefully thought-out tag structure, filters and a search function are intended to create a permanent archive of useful resources that are easy to find whenever they are needed. Hacking Chinese Resources is still under development, but most things should work relatively well. If you have comments or feedback of any kind, you can just leave a comment here or contact me in any other way.Also, I don’t know about all cool resources out there, I need your help! If you want to participate in this project, contact me in some way and tell me why you want to join. I also need your e-mail address. If you want to read more about the tag structure, please check this document. Hacking Chinese Resources is still under development. There are lots of problems we know about that we want to fix in the near future, but please report any bugs or other things you would like to see on the site. When I say “we”, I mean myself and Stefan Wienert, who has helped me with the coding and is also hosting the new section (read more about the design process on his blog). I’m also grateful to Julien Leyre, who offered invaluable feedback on the tag structure, as well as to all the people on the Hacking Chinese feedback list who helped me with the site before today’s release. I hope Hacking Chinese Resources can be a valuable asset to students and teachers of Chinese all over the world. In order to make that come true, I need your help. If you don’t want to participate yourself, then at least help me spread the word by sharing this article or Hacking Chinese Resources on social media or telling your friends about it! Sounds good! I hope we can turn this into THE place to go when you’re looking for specific resources. I have sent an invite to the e-mail address you used here. Please also glance through the document I linked to in the article since it contains some basic information about the tags. Looking forward to your participation! Hey Ollie I’d love to give the resources a shot. I’ve followed HackingChinese for quite some time and I’ve always been impressed with your insights. Im sure it would be helpful for me to see the resources you’ve curated. I hope you’ll like the new section! If you have any suggestions or feedback, let me know! Hi Julia! Just using the site and reporting anything that’s missing or isn’t working would be very helpful, thanks! You can use the site as much as you want, but you will need an invite to vote, discuss or post. Hi Jennie! I’ve sent you an invite, check your spam filter if you can’t find it. Also, if you want to read more about the tags used, please check the document I linked to in the article. 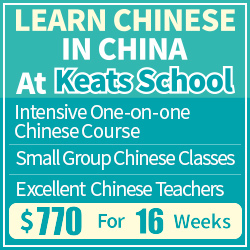 I’ve been in education and teaching Chinese for over 20 years. I’m keen to trial your material and recommend to others once you’ve ironed out the bugs. Hi Ken! I’ve sent you an invite! I think the site should be quite useful as it is and it already contains almost 200 resources. There are of course problems, but I don’t think they are serious enough to make the site less useful. If you find anything, let me know! I’m an advanced Chinese learner, but I’ve been taking a break for a year or so. I’d love to check out your new Resources site and brush up again. I’m most interested in listening and speaking, as it’s easy enough to study vocab and reading on my own. Great! As an advanced learner, I think you might have lots of cool resources yourself. Do you want an invite so you can help me by sharing what you have found? Good luck in any case! Yes, I would love an invite. Thanks! I am a Chinese teacher, working on acquiring more advanced Chinese myself, and have often been helped by resources you’ve referenced here, Olle. I also participate in a blog about Chinese language instruction. I’d be very glad to participate in this project. Cool, I’ve sent you an invite! 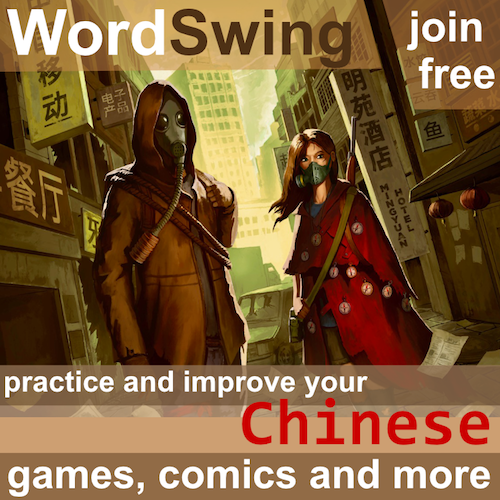 I’ve been studying Chinese in Taiwan for a little over a year and have often benefited from your site. I’d love to have a look at this new resource. The resource site is officially launched, so you can use it right now if you want to. You do need an invite to be able to vote, discuss and post resources, though, so let me know if you want one! I love your website and refer to it often, Olle! I’m a Chinese teacher and have been collecting and sharing resources with my students for many years. I’m excited about your new project and will be glad to participate! Great! I have sent you an e-mail. If you want to know more about the tag structure, check the document linked to in the article! Also, if you have any comments, just let me know. Is there a way to alter the description of links one submitted? Also how does the voting system work – just curious as there are some links I can up- and downvote and then there are some I can only upvote. Yes, there is an “edit” between the date and “delete”. You can only change your own links, though. Regarding the voting, I’m not sure what’s going on. The only limitation I know of is that you can’t down vote for some time after registering, but that should be the same for all links. Hmmm…not sure if I’m not seeing it or it is not there. Maybe something to look into: That’s what I can see: Screenshot from the link I submitted – without edit button..
Weird. I have a non-admin account and I can edit/delete any links I have posted myself with that account and you should be able to as well. I’ll investigate further and get back to you later, sorry! Now I know what’s keeping you from editing. The default settings only allows you to edit a post 30 minutes after posting it. That limit has now been increased to a week. Apart from this, if an admin has edited your post, you lose the ability to edit it yourself. I can’t remember if I added/removed tags from your link, but could you please try again? If it doesn’t work, let me know what you want to change and I’ll fix it for you. The general idea behind the settings are sound, I don’t want people to edit old links if there isn’t a special need to do so. Hi Olle, thanks for your reply. I think a tag was changed by you so that’s why I can’t edit it anymore. But it’s fine for now. The voting still does only work on some links – just checked if there is a pattern – it seems like after 14/15 days a link can’t be downvoted anymore only upvotes are possible, but that might be wanted. There might be some limitation to voting, I need to check, but if they put it there by default, I’m sure they have a reasonably good reason for it (as you say), so if I don’t have a particularly good reason for changing, I will just keep the default setting. We can always change later if we need to! Your site is great, and I’m excited about this resource tool! I’m a Chinese tutor and frequently refer people to your site. I’d love to contribute if you can send an invite. Thanks! This is a great initiative! I really like the way you’ve decided to organise the HC resource bank. Very easy to navigate and lots of good resources already. I recently moved back home to Sweden after 7 years of living and working in China and my wife (who is a Mandarin teacher) and I are currently looking into ways that we can contribute to making the early stages of learning to communicate in Mandarin more fun and motivating. I’d be happy to participate in this project. Your situation sounds pretty similar to mine. 🙂 I have sent you an invite! If you have any comments or feedback, just send me an e-mail or leave a comment here! I can speak common putonghua to a fairly high level to be able to travel and live in China quite easily without needing to read. I can learn new words easily also as well as local dialects too. Now I am living in Hong Kong, since mid 2011, and have a lot trouble finding food to learn about and to eat as the food here is very different to Mainland China. Of course speaking in gangdonghua is very different to putonghua, and not many people here speak common putonghua. All local younger Chinese in Hong Kong learn standard putonghua, but of course only use it to pass exams in their studies, not for every day living. So my need is to be able to read eating/drinking menus which of course will lead me into speaking the local hong kong guangdonghua. Hi Olle, I’d be happy to participate. I’m one of those Chinese learners who is embarrassingly more familiar with the tools and learning aids than with the language 🙂 I happened to come by here because I couldn’t remember the name of Niel’s excellent site, HanziCraft. PS: a small bug in this blog: using Chrome, the “Notify me of follow-up comments by email” checkbox is hidden under the “POST COMMENT” button. I’m a final year BA Chinese and Korean language student and I’d really like to participate. I lived in Beijing for my year abroad in 2013 during which time I worked extensively at Beijing TV Station and also worked translating and dubbing scripts from Chinese to English. Since I’m now a fairly advanced Mandarin Chinese speaker, I’m really keen to help contribute and share the resources I use / have used to foster an environment to help others. Thanks very much! Hi Anna! Sorry for the late reply, but I have sent an invite to the e-mail address you left here, looking forward to your contributions! I would like to participate in your project and can offer language variables and bring in many non academic/common Chinese words and slang. I have a vast pdf of Hong Kong slang compiled by an English Policeman over many years I would be more than happy to share with people. As I am an English teacher here I come across many problems us gwai lo (white foreigners) experience in Guangdong (Canton) and Heunggeng (Hong Kong). Likewise as laowai (foreigners) in zhongguo (China). I have been able to find some very useful solutions which local people (Chinese) appreciate. Because I am quite immersed in Chinese culture I use some Chinese words in my English conversations with local people which tends to give them face. Giving face is very important in most Asian countries. Hi Rodney, I have sent an invite to you! I’d love to join in, too! I am a K-12 Chinese teacher and I’m always looking for new resources. After a five year absence from Chinese, you really helped me get back on my feet (thanks, by the way). I have sent you an invite too! Hi Olle, I would like an invite. I am a student of Chinese beginning in 1973. Always interested in learning more language and self study pedagogy. I am interested in the resources and would be happy to provide feedback in ux and design. I have sent you an invitation! Hi Olle, Hackingchinese has been great for my chinese. I would really appreciate an invite. Thanks alot. Hi Olle, I have some resources I’d like to throw out – my own and my wife’s creations (my wife is a Chinese teacher). I think they would be a great addition to your growing list. Thanks for considering inviting me! hi Olle, im afraid i never got the invitation. wonder if i could trouble you to resend. It’s because the system is still broken, sorry about that. 🙁 I will get back to you when it’s fixed. I don’t know the reason, but I didn’t receive anything to jon@mandarinme.com. Maybe I typed in the email address wrong. Anyway, I’ll fill in a different email address as I submit this. Sorry to trouble you to send once more!